In this article you'll learn how to use Payee Support Charges, which are customizations around AWS Business and Enterprise Support that are assigned to any account family or payee(s) in your payer account. The main screen shows you each of your Account Families or AWS Payee Accounts, along with a choice of Business Support or Enterprise Support and their configuration options. These newly-generated Support charges will appear in the payee accounts and on Invoices only after AWS has finalized the billing month. CloudCheckr will find the total List Cost for the payee or account family and calculate the appropriate support charges using the AWS standard rate tiers. We will then add a charge into the List Cost for the appropriate support charge. You will only see the support charge appear when the AWS invoice is finalized. Enterprise Support charges will be calculated based on the percentage of the total Unblended Cost (so if the account is 10% of total spend, you will get 10% of the total Enterprise Support amount calculated based on accounts receiving Enterprise Support). 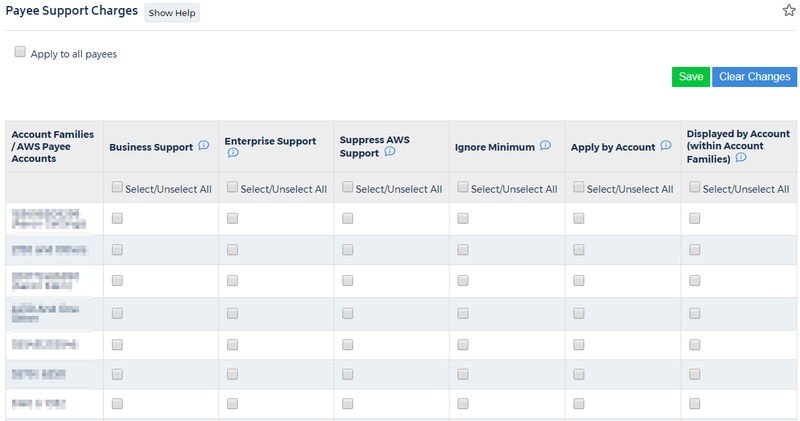 Hide the original Support charge from AWS and only show the Support charge generated by CloudCheckr. Create a 10% Support charge regardless of how little the account has spent. For use with Account Families. This creates Support charges for each account in the family. Used together with Apply by Account. This displays Support charges for each account in the family. Business Support: When you select Business, you will not be able to select Enterprise. Suppress AWS Support: Hides the original charge created by AWS. Ignore Minimum: Stops the minimum $100 charge and changes it to 10%. Apply by Account: When used with Account Families, creates a Business Support charge for each account in the family. Displayed by Account (within Account Families): Used to display the newly-created Business Support charge. Just select the Enterprise Support button for your chosen account/account family -- all other options will be grayed out. The charge will automatically generate. -Accounts with other types of Support will not count toward the Enterprise Support calculation. -Enterprise Support is calculated after refunds, but before any CloudCheckr Custom Credit Memos.